1. Creative Subscription Models – Why charge $1.50 for one print newspaper when you can have varying subscriber levels on the Internet? You can sell subscriptions by the month, by the number of articles read, or for an annual full-featured service. Learn how to divvy up your online content in new and creative ways to generate more niche income streams. Sell individual features instead of an entire newspaper at one time. 2. Internet Advertising – Advertising can be sold in various formats like banner, blocks, and ads that roll out before the content is viewed. Unlike print publications, newspapers have far more opportunity to advertise because the space is no longer just one flat page with fixed dimensions. It can come in as a popup, a slide-in, or an embedded link. It can be included in a newsletter, a website, or a special paid feature ebook or article. 3. Event Hosting – Newspapers can sell ways to roll out events online. 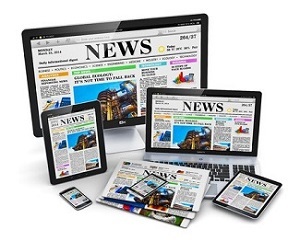 A newspaper’s readership is the ideal community for businesses to reach out to host an event. You can host a contest that appeals to a particular company’s business model and then offer to provide them with a sign up page for the contest where they can find new marketing leads for their services. You can generate buzz with an online social media campaign to promote the contest too. 4. Integration with Social Networking – If you are savvy about the social media world, you know it can be the best way to compete with the individual reporting without the aid of a news agency. Social media leads to a large exposure for your stories and can help lead people back to your website. This generates more views and potentially more new customers to your service. Combine social media marketing with mobile marketing and you can even reach viewers who are on the go. 5. Strategic Partnerships – You can make numerous partnerships to help you get the word out about the events you host as well as promoting other people’s brands online. The more channels you find to help generate a wide web of partnerships, the larger your online reach and sales. You can learn to bundle your online content with other providers to help you both generate a new income stream. By implementing some of these strategies, a newspaper can thrive, instead of succumbing to the idea that the Internet limits a newspaper’s ability to generate income or reduces their subscriptions. It’s all a matter of becoming a content provider, not just a news outlet, and learning how to deliver the content people want in the formats they desire at a price they are willing to pay.